There’s an outstanding balance on your account. Let us know if we can help you make a payment. Oops...your email and/or password is incorrect. You won't be billed anything until the day of your first delivery. We'll let you know as soon as we're in your neck of the woods, thanks! Please enter a valid postal code, thanks! You can log onto our site anytime after Friday at 3 pm to add items to your cart and/or complete an order. The deadline to place an order is the day before your designated delivery day at 10:00 AM (e.g. Tuesday at 10 am for a Wednesday delivery). If you are trying to place an order after that time, we will do our best to accommodate but we ask that you contact customer service to discuss further. Produce baskets can be ordered any time and are customizable until 10:00 AM on the day before your delivery. We will notify you by email each week when produce baskets are ready to be customized (typically Friday afternoon). We’ll charge your credit card on the day of your delivery. For subscriptions, you don’t need to visit the website each week as your credit card will be billed automatically during weekly processing. Please update us with any changes to your billing information to avoid missing a delivery. If we are unable to process your payment, we may not be able to send you a delivery that week. If we can’t reach you for payment after multiple attempts, we may also have to suspend your account until we can recover payment. This is only a last resort and we always try to avoid doing this. 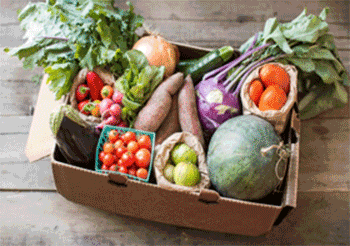 If you have a subscription but do not customize or otherwise amend your order each week, we will continue to send you any subscription items on your account such as your weekly produce basket. If you are receiving a weekly produce basket, we will automatically remove any items you have listed as “Dislikes” in your Produce Preferences on the website and replace them with comparable items. If you want to skip a week of your subscription or amend your subscription, we ask that you log on to the website or call us to make the change(s). We deliver orders Monday to Friday each week. Your area has a set delivery day determined by your address (we’ll contact you once you register to confirm your delivery day but you can see our delivery map to get an initial idea). Deliveries occur after 1 PM on your scheduled delivery day, and we do our best to deliver between 1 and 8 PM. It would be amazing if you were available on your delivery day to receive your order in-person. However, if you are unable to be home at the time of delivery, we will leave your order for you. Your order will be delivered to your front door unless you provide us instructions to leave it in an alternative area of your home that we have access to (i.e. a side door, a garage). We particularly encourage you to leave us a cooler or let us know if there is an indoor area we can leave your items when it is below minus 10 degrees Celsius or above 20 degrees Celsius. We will deliver to your unit door if you are able to buzz us through the front doors. We are also happy to leave your bin with a doorman or concierge, but we ask that you get permission in advance from the doorman/concierge. Other delivery options may be possible so please be in touch to discuss this. We’ll do our best to work something out! We take the utmost care to safely package and transport perishables, such as dairy and other temperature-sensitive foods. If a delivery of perishable items is made while you’re not home, we cannot take responsibility for the quality or safety of items after delivery. Therefore, we recommend that you be home to receive your delivery if you are ordering perishables. If you have ordered perishables and will not be home at the time of your delivery, we recommend that you leave a cooler with ice packs or frozen water bottles by your door for the driver to deliver perishable products. In the event that you are not home and no cooler is left out at the time of delivery, we will leave your perishable items in as safe a manner as possible but cannot take responsibility for the quality or safety of those items. We stand behind the quality of our products. If you’re unhappy with an item, we’ll credit you and provide a replacement to you at no cost on your next order. In some instances, we may also ask you to return the item to us so that we can validate the quality issue. We ask that you notify us within 3 days of experiencing a quality issue so that we can promptly address the issue. If you need to cancel an order, we ask that you cancel prior to 10:00 AM on the previous day to your scheduled delivery (e.g. Tuesday morning at 10 am for an order scheduled on Wednesday). We typically deliver between 1 and 8 PM on your delivery day. However, we cannot absolutely guarantee delivery within that window (sorry!) as traffic, weather and other factors can sometimes create unforeseen changes to the delivery schedule. You can generally count on receiving your delivery at the same time each week, but delivery routes are subject to change from time-to-time. In the event that we are out of stock of an item that you have purchased, we will replace it with a comparable item and notify you of the change. If you are unhappy with the substitution, please let us know and we will provide a credit on your account. In the case of produce, if an item is unavailable, we will do our best to replace the item with a comparable item from your “Likes” and never substitute with an item on your “Dislikes” in Produce Preferences on the website. The number of items contained in the produce bin will vary from week to week depending on the bin contents. 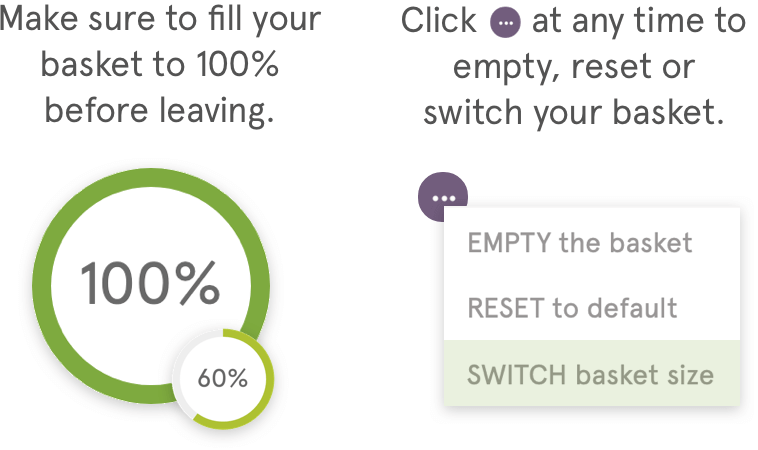 Each bin size and type contains a fixed number of credits, meaning that if you add higher-value items to your bin, you will receive less total items in the bin (and vice versa). Once you register with us, you will receive order reminder notifications sharing the contents of the week’s produce basket and sharing other news on Mama Earth happenings. We may also send you a newsletter from time-to-time which you can unsubscribe from at anytime using the "Unsubscribe" link at the bottom of the newsletter email. We may use frozen water bottles to help keep items in your bin cool. Please do NOT drink these water bottles. We sometimes refill them. We hope you’ll return them with your next order (you can leave them in your bin) so that we can continue to use them. Only one promo code can be applied per person, household, or account. If you have any other questions, please don’t hesitate to contact us by email (heather@mamaearth.ca) or phone (416-850-8662). Sorry, couldn't recognize that email address or password. Please try again. Persistent Login By checking this box, you agree to stay logged in to your account on this device for 15 days. The time for changing your order has passed unfortunately. You can make changes to next week's order starting at 5 pm on your delivery day (e.g. 5 pm on Monday if your delivery day is Monday). You don't have an order! Nothing's scheduled for this week. Your account is currently on hold, you'll just need to get in touch with us to place an order. Give us a call at 416-850-8662 or email heather@mamaearth.ca and we'll get you back up and running. Thanks! Are you sure you want to leave this page without saving it? Do you want to leave the page? You'll lose any changes since the last time your basket was full. Looks like your delivery day has changed, so your Skip-a-Week schedule was reset. Would you like to review your Skip-a-Week schedule? Thanks for the update, we're on it! Thanks for updating your delivery address. Our customer service team will be in touch in the next 1-2 days to confirm your address change and let you know if this change will impact your delivery day. Tell us what we can do for you! As a thanks for your time, you'll have a chance to win one of two $500 Mama Earth credits. Looks like your cart is empty, Would you like to Skip-this-Week schedule? To remove these items, you’ll need to customize your basket. Are you sure you want to reset this basket to the default items? Your customizations and any changes based on your preferences will be lost. Are you sure you want to remove all items from your basket? Organic Salted Almond Milk Chocolate Bar? Mix it up! You can switch this week’s basket to any of our other options below. If you’d like to permanently make this change, head over to your Subscriptions and click Switch Basket. Only Local Basket ($35) to Family Basket ($50)? Any customizations to your first basket will be lost. Mix it up! You can switch your standing order basket to any of our other options below. Did you want to remove this basket from all future orders or are you looking to skip this week? Can we help to simplify your life? Add, remove and customize your basket to your heart's content, watch below for a quick demonstration. Thanks! We've sent you a confirmation email.